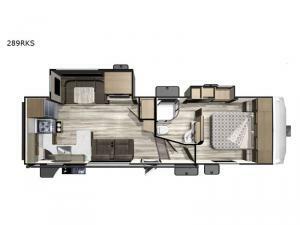 Calling all adventure seekers: it's time to take a step into comfort and innovation with this Telluride fifth wheel. After a day of exploring, you can return to full kitchen and bath amenities, plus you can enjoy a cozy fireplace with an LED HDTV above for inside entertainment. You might even choose to stay inside while relaxing on the theater seats with heat and massage or retire to the private master suite's queen-size bed. You can cook meals inside or outside with the addition of the outdoor kitchen, and the electric awning with LED lights makes it possible for you to eat your dinner outside with protection from the elements. You will enjoy any Starcraft Telluride fifth wheel for the rich amenities and contemporary color palette that it boasts! Each model includes a 15,000 BTU air conditioner, a heated and enclosed underbelly, a water system winterization kit, and a Climate Package so that you will be able to stay comfortable while you travel during any season. You will also find the interior to be breathtaking with its seamless solid surface countertops and stainless steel appliances in the kitchen, and the residential flooring will be a stylish addition to the rest of the modern decor.